The first real move north was to Rendova Island in the New Georgia Group about 180 miles northwest of Lunga Point, but this most worthwhile step was preceded by an advance a stone's throw away to the Russell Islands lying only 30 miles northwest of Guadalcanal Island. It was more than several months after Rear Admiral Turner arrived at Noumea from Guadalcanal for the first time, on 13 August 1942, before he started to think about, and his staff started to plan, the first offensive step forward from Guadalcanal to Rabaul. The Amphibians had learned a good deal from the August landings at Tulagi and Guadalcanal, and they continued to learn a great deal during the long, hard five months' struggle to maintain logistic support for these two important toe holds in the Southern Solomons. By January 1943, marked changes had occurred in their thinking about the techniques of support through and over a beachhead, and new amphibious craft were just becoming available. They were anxious to test these changes and the new craft on a strange shore. Note: With the close of Chapter XII, Admiral Turner disappears, with very minor exceptions duly noted, as a direct source of information, comment and opinions not only of this work, but of the events related. The author, due to Admiral Turner's sudden death, did not have the opportunity to discuss with him, in detail, any of the later operations of the World War II amphibious campaigns of the Pacific. Fleet after the North African Landings that COMINCH issued on 18 January 1943, Ship to Shore Movement U.S. Fleet FTP 211. The last of the Japanese troops evacuated Guadalcanal on 7-8 February 1943, at which time WATCHTOWER could be marked in the books as completed. The pressure was immediately on the amphibians to get moving. Thirteen days later the amphibious forces of the South Pacific Area landed in major strength on the Russell Islands. The Russell Islands landings were made unopposed and undetected. Since there was no blood and gore associated with the operation, it has been brushed off lightly in most historical accounts of the period. The Staff Allowance, Commander Amphibious Force South Pacific: Rear Admiral Kelly Turner in center with Colonel Henry D. Linscott, USMC, Assistant Chief of Staff, on his right and Captain James H. Doyle, USN, Operations Officer, on his left. The Russell Islands are 60 miles west-northwest of Henderson Field on Guadalcanal. The two main islands of the Russells are Pavuvu and Banika, the former being about twice the size of the latter which is nearest Guadalcanal. The first named island, mainly a 1,500-foot jungled foothill in 1943, is fanged in shape and about eight miles north and south by seven miles east and west. The latter island is about eight miles by two miles and is slotted by two comfortable inlets, one on its east coast, the other on its west coast. While there is a 400-foot high knob in the southern part of Banika, the rest of the island is low and in 1943 was clear of jungle although with many beautiful coconut trees. 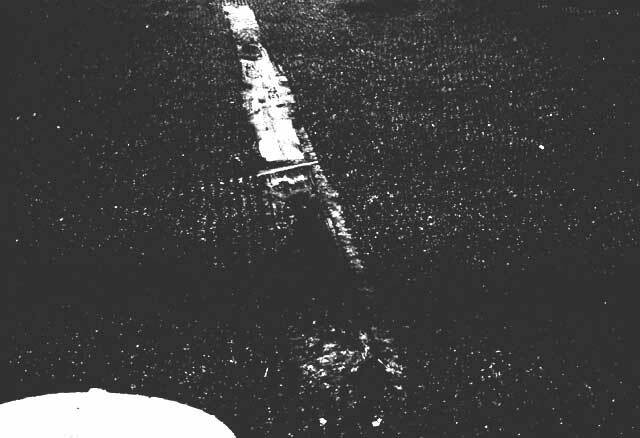 It was judged suitable for an airfield. These two main islands, separated by Sunlight Channel half a mile wide, are surrounded by dozens of small islands extending to ten to twelve miles off shore, particularly to the eastward. The most vivid remembrances of those who touched stays with the Russells were of "rain, mud, and magnificent coconuts." When Commander South Pacific Area issued his final CLEANSLATE Operation Plan, he initiated an action with a major resemblance to its predecessor, the WATCHTOWER Operation, in that there was to be no long planning period available to Rear Admiral Turner's staff prior to the actual landing just nine days away. to establish a staging point for landing craft preliminary to further forward movement. Rear Admiral Turner, COMPHIBSOPAC, was named as the Commander of the Joint Force designated Task Force 61, with the Commanding General 43rd Division, Major General John H. Hester, U.S. Army, being the Commander Landing Force. Despite the fact that in February 1943 none of the Landing Force troops were in the Guadalcanal area except the Army Regiment designated as Troop Reserve, and the anti-aircraft contingent of the 11th Marine Defense Battalion, Task Force 61 was tailored for a "shore to shore" amphibious task. In the language of the amphibians this meant that the assault movement of personnel and material would move direct from a shore staging area to the landing beaches of the assault objective, involving no further transfers between types of landing craft or into landing boats during the assault movement. The shore staging area designated for CLEANSLATE was Koli Point, Guadalcanal. Gavutu Island in Purvis Bay would handle the overflow. Such a "shore to shore movement" meant that the long distance over-water movement to Guadalcanal of the amphibious troops participating in the D-Day initial landings of the CLEANSLATE Operation had to be carried out prior to the final embarkation at Guadalcanal for the assault. Each with 4 LCP(L) and 15 LCR(L) on board. Each destroyer types except Hopkins, Wilson, and Landsdowne towing 1 LCM, 1 LCV and 2 LCP. Bobolink (AT-131) with 1000-ton flat top lighter in tow. 8 of the 11 boats in the Squadron were to be picked for the operation. * Gridley substituted for Hovey in initial movement. The Landing Craft, Tank (LCT) of 1942-43 was 112 feet over-all, had a 32-foot beam, and a draft of a little over three feet. It was normally expected to carry four 40-ton tanks or to load 150 to 180 tons or about 5,760 cubic feet of cargo. Its actual speed, loaded and in a smooth sea, was a bit more than six knots, although it had a designed speed of ten knots. These large tank landing craft, which shipyards in the United States started to deliver in large numbers in September and October of 1942, were the first of their kind to be used offensively in the South Pacific. The LCT had but one commissioned officer and 12 to 14 men aboard them when they arrived in the South Pacific. The LCT's were not commissioned ships of the Navy, the one officer being designated as the Officer in Charge. They had insufficient personnel to keep a ship's log, much less a war diary, and by and large they passed in and out of their service in the Navy leaving no individual record, except in the memories of those who served in them or had some service performed by them. Presumably, the LCT Flotilla and LCT Group Commanders kept a log and a war diary, but if they did so, by and large they have not survived to reach the normal repositories of such documents. The first mention of the LCT in Rear Admiral Turner's Staff Log occurs on 19 December 1942, when 6 LCT (5) were reported at Noumea loading for Guadalcanal. Presumably the LCT arrived on station earlier that month. Through the leadership efforts of Rear Admiral George H. Fort (1912), his Chief of Staff, Captain Benton W. Decker (1920), and after arrival in SOPAC his senior landing craft subordinate, Captain Grayson B. Carter (1919), the Landing Craft Flotillas, PHIBFORSOPAC, were trained under forced draft. After only 12 months of war, the landing craft were manned to a marked extent with officers and men who had entered the Navy after the attack on Pearl Harbor. To assist in the training, Commander Landing Craft Flotillas in due time issued a comprehensive Doctrine full of instructions and information for the dozens of landing craft moving into the SOPAC command during the January to June period in 1943.8 The LCT "Veterans" of CLEANSLATE became the nuclei for this massive training effort. Most of the senior officers in this organization (Jaeger, A.L. Jones, Kouri, and Wiseman) participated in CLEANSLATE. They got the LCT's off to a good start in the South Pacific. The largest landing craft carried by the amphibious transports and cargo ships was the Landing Craft, Medium (LCM). The LCM could carry 30 tons or 2,200 cubic feet of cargo. Amongst the smaller shipborne landing craft, both the Higgins Landing Craft, Personnel (LCP) and the ramp LCV could transport 36 men or one medium tank. The destroyers which had been converted into fast transports could carry 200 troops and limited amounts of these troops' equipment. The converted fast minesweepers could carry somewhat fewer troops. (PTs) of Torpedo Boat Squadron Two, and twelve LCT's of Landing Craft Tank Flotilla Five. The TF 61 Operation order for CLEANSLATE indicates that the 12 LCT's were from LCT Group 13, but as a matter of fact there were seven LCT's from Group 13, four LCT's from Group 14, and one from Group 15, all temporarily assigned to LCT Group 13 for operational control. Of the 16 ships, 108 large and small landing craft and 8 motor torpedo boats in the spit kit amphibious force and CLEANSLATE, only the fast minesweepers Hopkins, Trever, Southward, and Zane, and the destroyer Wilson of the ships in the original WATCHTOWER invasion task force shared with Rear Admiral Turner the satisfaction of participating in the initial phase of the first forward island jumping movement of the South Pacific Area. The Hovey (DMS-11) lost out on this high honor when she did not arrive at Guadalcanal in time to load and the Gridley (DD-380) was substituted for her in the initial phase of CLEANSLATE. In addition to the 43rd Infantry Division (less its 172nd Regimental Combat Team) the major units named to participate in the operation were the Marine 3rd Raider Battalion, anti-aircraft elements of the Marine 11th Defense Battalion, half of the 35th Naval Construction Battalion and ACORN Three, and the naval unit designated to construct, operate, and maintain the planned aircraft facilities on Banika Island. An ACORN was an airfield assembly designed to construct, operate, and maintain an advanced land plane and seaplane base and provide facilities for operation. Marine Air Group 21 and the 10th Marine Defense Battalion were enroute to the South Pacific Area and were to be assigned to the Russells upon arrival. CLEANSLATE was the first major amphibious island jumping operation where radar-equipped planes, "Black Cats," were used to cover all of the night movements of our own ship and craft against the approach of enemy surface and air forces. CTF 63, COMAIRSOPACFOR, Vice Admiral Fitch, was ordered to provide long-range air search, anti-aircraft cover, anti-submarine screen and air strikes. If needed, he would supply direct air support during the landing and advance from the beaches. support to TF 61, and the fast carrier task forces were ordered to be within supporting distance of the Russells on D-Day to deal with any major Japanese Naval Forces entering the lower Solomons. When COMSOPAC issued his despatch Operation Order for CLEANSLATE on Lincoln's birthday, 1943, the 43rd Division troops, ACORN Three, and the naval base personnel were in New Caledonia 840 miles south of Guadalcanal, while the Marine raiders and the construction battalion were in Espiritu Santo 560 miles to the south. The staging movement of Army troops and Marines, Seabees, and other naval personnel into Guadalcanal and Gavutu was accomplished in large transports and cargo ships, six echelons arriving before D-Day, 21 February, and four follow-up echelons moving through after the 21st. During the nine-day period between the issuance of COMSOPAC's CLEANSLATE Operation Order and the actual landing, two groups of observers from TF 61 visited the Russells and reported that the islands had recently been evacuated by the Japanese. These parties obtained detailed information in regard to landing beaches and selected camp locations and anti-aircraft gun sites. The second group remained to welcome the Task Force, and marked the landing beaches to be used. This was a task later to be taken over under more difficult and dangerous conditions by the Underwater Demolition Teams. The main movement of the amphibians from the staging areas to the Russells was planned and completed in four major echelons. Over 4,000 of these were landed in the Russells from the first echelon ships and craft on the first day. 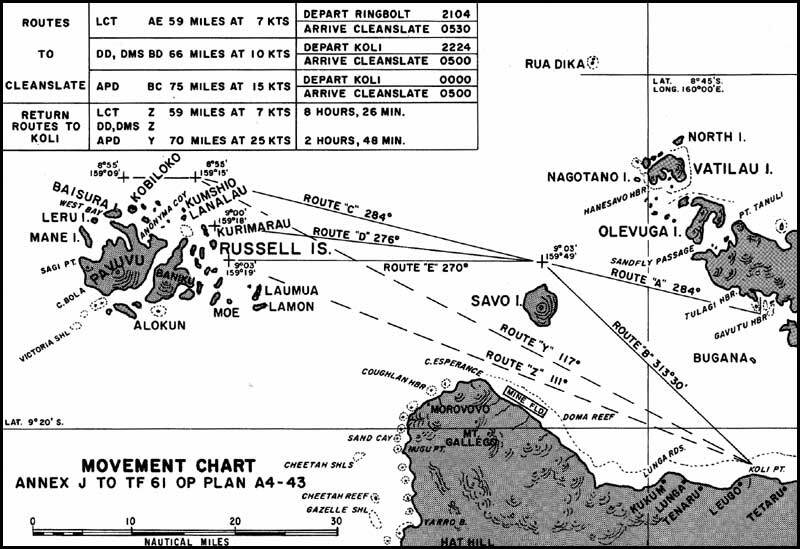 The over-water movement from Koli Point, Guadalcanal, to the Russells for the initial landings was planned and largely carried out as shown on the accompanying movement chart. During the preliminary movement when the first echelon of the 43rd Division was being staged the 840 miles from New Caledonia to Koli Point, Rear Admiral Turner moved with them in the McCawley which carried part of the amphibian troops. On 16 February 1943, he shifted his operational staff ashore to Koli Point from the McCawley. During the first phase of the CLEANSLATE landing operations he flew his flag in the fast mine-sweeper Hopkins, and commanded the Transport Group, TG 61.1. On 19 February 1943, one task group (4 APA, 1 AO, 6 DD) carrying the second echelon of the amphibians and their logistic support from Noumea to the Koli staging area on Guadalcanal was subjected to a seven aircraft Japanese torpedo plane attack when about 20 miles east of the southern tip of San Cristobal Island. By radical maneuver, the transports and their destroyer escorts escaped damage, and by spirited anti-aircraft fire accounted for five Japanese aircraft lost. Otherwise, the ten-day preparation period was largely unhampered by the Japanese. and for anti-submarine patrolling) towed four landing craft: two Landing Craft, Personnel (LCP) and two Landing Craft, Vehicle (1 LCV and LCM). The four fast transports each carried, in addition to troops, four LCVPs and 15 rubber landing boats. The mighty Bobolink (AT-121) towed a 1,000-ton flat top lighter for use at Wernham Cove. CLEANSLATE went off with precision, but without fanfare or publicity since it was believed that the Japanese were unaware of the preparations for the operation or its execution. So besides radio silence, there was press and public relations silence. All the ships and landing craft, except one LCT with engine trouble, departed for their return passages to Guadalcanal by 1230 on D-Day. The 800 men of the 3rd Marine Raider Battalion, which had missed out on the WATCHTOWER Operation, were loaded onto four destroyer transports at Koli Point and at 0600 on 21 February landed on Beach Red in Pepesala (Paddy) Bay, Pavuvu Island, where the Japanese formerly had their main strength and where Major General Hester, Commander Landing Force, in his Operation Order expressed the opinion "definite possibilities exist that enemy patrols and small units may be located." Rear Admiral Turner, Major General Hester, and their operational staffs went ashore from the Hopkins onto Beach Yellow in Wernham Cove, Banika Island. They landed just after 800 troops from two DDs and two DMSs and additional troops ferried in by eight LCT's had landed. The Naval Base Headquarters was established on the north side of Wernham Cove. Another 800 troops from three DDs and one DMS and additional troops aboard four LCT's landed at Beach Blue, Renard South. Most of the Banika Island troops came from the 103rd Regimental Combat Team of the 43rd Infantry Division. A follow-up landing of 800 troops from the 169th Infantry Regiment of the 43rd Division, U.S. Army, took place on the sandy beaches of Pepesala (Paddy) Bay in northern Pavuvu Island, early on the morning of 22 February, the day after the Marines had landed in this area. At the same time 1,400 more troops landed at Beach Yellow in Wernham Cove. The second to fourth follow-up echelons moved on D plus 2, D plus 3, and D plus 4. The ships and craft continued to make most all their movements between Guadalcanal and the Russells at night, so as not to alert the Japanese to the operation. The destroyer-types made a complete round trip at night, while the LCT's largely made one-way passage each night. No public disclosure of the landing was immediately made and the base at CLEANSLATE maintained radio silence. In two days 7,000 troops were landed. By 15 March, 15,500 troops were in the Russells and by 18 April when, at long last, command passed to the Commanding General, Guadalcanal, 16,000 men were busy there and no less than 48,517 tons of supplies had arrived there by amphibious effort. The Japanese did not react to the occupation for 15 days. On 6 March 1943, they made the first of a series of air raids. Commander Charles Eugene Olsen (1919), who had successfully skippered the early base building efforts at Tongatabu, and who had impressed Rear Admiral Turner when he had flown through the Tonga Islands in July 1942, was brought down and given the task of building the Advanced Naval Base in the Russell Islands. By the end of March, on Banika Island, there was a good airfield with three fighter squadrons on Marine Air Group 21, a motor torpedo base (at Renard Sound) and a growing supply activity. Old Man Weather and his twin, navigational hazard, unhappily put three destroyer-types (Lansdowne, Stringham, Sands) on the beach on February 26th. The landing craft had a normal ration of unintentional groundings and breakdowns, but none of the destroyer-types became permanent additions to the Russells. As soon as all forces had landed, the airfield constructed, and stocks of ten units of fire and sixty days supplies built up, command was to pass to the Commanding General at Guadalcanal. Long before this blessed event occurred, Rear Admiral George H. Fort relieved Rear Admiral Turner as Commander Task Force 61 (on 3 March 1943) and Rear Admiral Turner returned to Noumea to continue his favorite chore of planning the next operation.
. . . What useful purpose is being served by operations on scale indicated by CTF 61's 270628? . . .
Halsey is planning to take Vila-Munda with target date April 10. Troops and material [are] headed in proper direction and thus completing first stage of next movement. When the Russell Islands logistical support movements were completed, COMSOPAC took note of this and smartly changed the code name of the Russells to EMERITUS. From the point of view of both COMSOPAC and COMPHIBFORSOPAC, the Russells had two great advantages over any and all other immediately possible objectives necessary to carry out the 2 July 1942 Joint Chiefs of Staff directive. 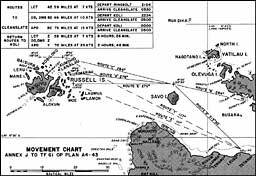 The Russells (1) were on the direct line from Guadalcanal to Rabaul and (2) they lay within COMSOPAC's command area, so that high level arrangements in regard to command did not have to be negotiated, a process taking weeks or months. It is merely a guess but the latter reason surely carried the greater weight with COMSOPAC in choosing a spot where a quick operation could be carried out when WATCHTOWER was completed. During the course of the operation a technique was developed for the movement of troops and cargo from a forward base to a nearby objective without the use of APAs and AKAs. It is expected that the experience of this operation will prove useful in planning future offensives. The CLEANSLATE Operation again demonstrated that the overwater movement and landing of the first echelon of troops is only the initial step in a continuous amphibious series, all of which are integral parts of the same venture. Success of the venture depends upon the ability to deliver safely not only the first, but also the succeeding echelons of troops, engineers, ancillary units, equipment and operating and upkeep supplies and replacements. The aggregate of personnel and cargo for the later movements is far greater than that carried initially. Each movement requires protection, and losses in transit from the logistic bases to the combat position must be kept low enough to be acceptable. It is particularly when small vessels are used that an uninterrupted stream of them must be maintained. From the period of its activation in July 1942 to the completion of its first major tasks in January 1943, the Amphibious Force, South Pacific had about the same number of ships and landing craft assigned with replacements being supplied for ships sunk or worn out in war service. But there was a steadily growing prospect of a real increase in size when the coastal transports and larger landing craft, building or training on the East and West Coasts of the United States, were finally cut loose and sailed to the South Pacific to fulfill their war assignment. By counting on one's fingers, it is obvious that among the large work horses of PHIBFORSOPAC there were now 18 ships (11 APAs and 7 AKAs) against 19 ships (14 APAs and 5 AKAs) six months earlier. However, there were 11 destroyer transports versus four at the earlier date and a definite promise of 127 landing ships and craft versus none at the earlier date. LCT's. However, in late January 1943, only a few of the early birds had been formed up organizationally in the United States, much less trained in amphibious operations and pushed at speeds of eight knots or less across the wide spaces of the Central Pacific to the South Pacific. It is interesting to note from this roster list that the fast learning officers of the Naval Reserve had learned enough by January 1943 to take over command of some of the destroyer transports. And it is a commentary on how slowly the sky rocketing wartime promotion system spread to the Amphibious Force SOPAC, to note that a year after the Pacific War started, a fair number of the captains of the large and important transports of PHIBFORSOPAC had 23- 25 years of commissioned service but were still wearing the three stripes of a commander. 1. (a) Staff Interviews; (b) CTF 62 letter, Ser 029 of 23 Aug. 1942, and replies thereto; (c) COMSOPAC, letter, A16-3/(00) Ser 00936 of 4 Dec. 1942; (d) TU 66.3 Op Orders H-1, J-1, K-1, K-2. 2. COMGENFIRSTMARDIV, Final Report on Guadalcanal Operation, Phase V, 1 Jul. 1943, p. 6. 3. (a) Staff Interviews; (b) CINCPAC, Command Summary, Book Three, 23 Jan. 1943, p. 1342. 5. COMSOPAC, 282239 Jan. 060636, 070506, 112230, 150247, Feb. 1943. 6. COMSOPAC, 070506, 112230 Feb. 1943. 8. Commander Landing Craft Flotillas, PHIBFORSOPAC Doctrine, May 1943. 9. CINCPAC, Command Summary, Book Three, 8 Feb. 1943, p. 1390. 10. CTF 61 Op Order Plan A4-43, 15 Feb. 1943, p. 6. 11. CTF 61 to COMSOPAC, 210551 Feb. 1943. 13. 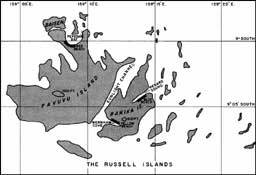 COMPHIBFORSOPAC, Report of Occupation of Russell Islands (CLEANSLATE Operation), 21 Apr. 1943, para. 19. Hereafter CLEANSLATE Report. 14. Time Magazine, 31 Jan. 1944. 16. CTF 61, 270628 Feb. 1943, and related COMINCH, CINCPAC, and COMSOPAC despatches. 17. (a) Morison, Breaking the Bismarcks Barriers Vol. V), p. 98; (b) Henry I. Shaw and Douglas T. Kane, Isolation of Rabaul, Vol. II of HISTORY OF U.S. MARINE CORPS OPERATIONS IN WORLD WAR II (Washington: Government Printing Office, 1963), p. 26. 18. Joseph Driscoll, Pacific Victory 1945 (Philadelphia: J.B. Lippincott Co., 1944), p. 66. 19. COMPHIBFORSOPAC CLEANSLATE Report, 21 Apr. 1943, p. 14. 20. COMPHIBFORSOPAC Letter, FE25/A3-1/Ser 007 of 20 Jan 1943, subj: Organization and Staff of Amphibious Force, South Pacific, FE25/A3-1/Ser of 20 Jan. 1943, and CINCPAC's Organizational Roster dated 29 Jan. 1943.